The Stealth BJJ Youth Team stepped out on the big stage last weekend competing at the first ever Elite BJJ World Championships. Over 1600 kids from as far away as Australia took part in one of the largest kids BJJ competitions. Parents proudly watched their children step onto the mat to test their grappling skills in an electric atmosphere. 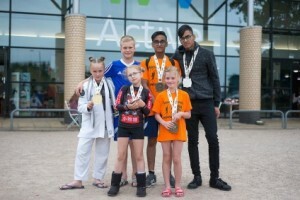 On Saturday the young warriors competed in the gi categories and produced some incredible performances despite the team only recently being established. In total the team took 3 gold, 3 silver and 5 bronze medals. Of particular note European champion Chloe Walker went on to win another title to become our first World champion. Hussain Ali won two very tough matches to take a silver in his second outing to a Brazilian Jiu-jitsu competition. International competitor Libby Genge took the top spot too becoming our second World champion to add to her huge collection of medals including NAGA grappling champion in Germany, Pan American Silver medalist and being last years European Champin. On Sunday the event held the no gi grappling categories. Made popular by MMA competitors grapple without the traditional jacket and trousers associated with BJJ and Judo. This makes the action very fast paced and exciting to watch as well has an obvious benefit for developing the children’s self defence. 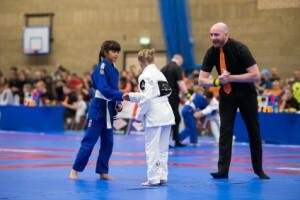 Libby took to the mat again and brought home a silver medal in her category before fighting in the open weight Absolute class against the top female competitors where she showed her dominance again beating two girls from Spain to become the first ever female Absolute Champion of the World. We are really proud of all the kids that stepped onto the mat to compete! Everyone has been working really hard over the past weeks in preparation for this competition. The kids are separated into experience, age and weight categories. For some it was their first competition and others are more seasoned competitors. Everyone did extremely well though and had a fantastic day even if they didn’t get the final result they wanted. Even though it is an individual sport and you step out on the mat on your own, it is great to see how the kids and parents support each other and how everyone is really part of the team. Competitions are also a great social event too and it’s great meeting people from other team and forming new friendships for both the kids and adults. The next outing for the squad will be the European Championships where we can expect fireworks as Stealth BJJ fight to build on this success.